The following exercises are designed for in-class use in an introductory anthropology course. They are linked to data in eHRAF World Cultures and eHRAF Archaeology. The purpose of the workbook is to give students a feel for ethnographic data, which should help their understanding of anthropological concepts and theories. Because the production of anthropological knowledge is an inductive process that is grounded in careful fieldwork and participant observation, reading ethnographic data is the logical first step in learning the discipline. Each exercise focuses on one topic and one or two readings. Students are asked to perform a simple manipulation of the data as a way of giving them a feel for the material. The Human Relations Area Files was designed to facilitate comparative research, but it also serves as a valuable source of ethnographic material. eHRAF is an electronic library for anthropology students and researchers. It is easily accessible on the Internet by students and teachers whose institutions subscribe to the service. Since its founding year in 1949, HRAF has indexed over 1,000,000 pages of ethnographic text according to the classifications of the Outline of Cultural Materials (OCM). The OCM is a vocabulary of over 700 cultural categories that allow a researcher to search for specific information cross-culturally. The OCM has its own index, which is continuously updated to accommodate changing research interests. Over 600,000 pages of text covering cultures from major regions of the world are currently available in eHRAF World Cultures. Each exercise is linked to the Culture Summary of the culture that is the subject of the exercise (see the Practical Guide to Using eHRAF for more information on where the Culture Summaries can be found in eHRAF World Cultures). Students who wish to read more about the topic may refer to the OCM category. Some of the exercises are linked to related material at the University of Kent’s Experience-Rich Anthropology (ERA) site. Access to eHRAF World Cultures and Archaeology require institutional membership. For a free trial and membership information, please call or email Member Services at 1-800-520-HRAF. To break up the behavioral stream into defined and discrete categories is a preliminary step in the production of knowledge. It is a necessary step in order for humans to see the world, communicate, and collectively engage the world. No system of categories can ever faithfully represent the world. Nevertheless humans must accept these categories as if their lives depended on them and they do. The German philospher Immanuel Kant’s (1727-1804) idea of the categorical imperative applies here: In order to act on nature humans must first define it and once defined treat these classifications with utmost seriousness. The anthropologist Gregory Bateson wrote about (Steps to an Ecology of Mind, 1972) his ambivalence regarding classificatory schemes, what he called outlines. On the one hand, Bateson realized that outlines were necessary in order to see and think clearly. On the other hand, because the world never fits precisely into any one classificatory scheme, outlines limit one’s experience and understanding of the world. For this reason, old classificatory schemes are often jettisoned and replaced by new ones. The study of culture is a study of how and why humans see the world the way they do. The first step in this study is to appreciate the arbitrariness of any ‘world view’. In this exercise students should break up into groups to classify ceramic styles, which is part of the process in the archaeological production of knowledge. Form groups and print out the pages of ceramic sherds from the Aymara Kingdom (900 B.P.-530 B.P.) in Peru (page A, page B, page C, page D, page E.) Cut out the individual sherds from each page. Study the sherds and group them by style. Give a name to each style. When finished compare results. What are your observations? Many people have a false notion that ethnographers are merely observers faithfully writing down what they see in an effort to understand the behavior of a foreign culture. In actuality, no ethnographer has the luxury to assume such an objective and distant view of a people. The ethnographer is not a birdwatcher. Living with the people she studies, she participates in the daily life of people, who have their own agendas and intentions. The ethnographic encounter is a two-way street, a form of cross-cultural communication in which questioning goes both ways. The ethnographer and her culture are as much a subject of curiosity and critical evaluation as that of the people “under study.” The object of the informant is to educate and enlighten the ethnographer about his culture and achieve a state of mutual respect. Often the ethnographer is treated as a child, because in terms of her cultural understanding and linguistic competence she is a child. The informant is also trying to establish a bond. For a third-world people that bond can be critical for how people are represented and regarded in the world, which can have consequences for their well-being. Ideally ethnography is a form of bridge building, creating the basis for understanding and communication between cultures. In this exercise read about the anthropologist Gracia Clark’s encounter with Asanti traders in her study of the Central Market of Kumasi, Ghana. Make an outline of the chapter to show the development of her relationship with her informants. Kinship matters. It constitutes a principal set of personal social relationships that guide action. Kinship does not determine action, but–to use the analogy of an electric circuit–it constitutes a pattern of potential connections along which can flow information, affection, and goods. Therefore, knowing who is related to whom and how they are related is the first step in understanding a community’s social structure and patterns of behavior. Other sets of social relationships such as age grades, friendships, and debt relationships cut across kin ties. Furthermore, some kin ties are never actualized or used only infrequently. One of the first tasks of an ethnographer is to gather information about kinship and genealogical relationships. This societal blueprint will form the basis for understanding behavior and point the way for further investigation. This exercise is an example of this initial ethnographic task. In this exercise read one of the following list of kinship terms from the Kanuri of northern Nigeria and construct a kinship chart based on the information provided. One of the earliest studies in anthropology was a classification of kinship terminological systems by Rochester-native Lewis Henry Morgan (1818-1881), who discovered that the Iroquois of upstate New York used a different system of kin classification than he did in his own culture. For example the Iroquois used the terms of ‘mother,’ ‘father,’ ‘sister,’ and ‘brother’ not only for their parents and siblings, but also for their parallel cousins, i.e., their mother’s sister and her family and their father’s brother and his family. Fascinated by this discovery Morgan organized a research project to gather information on kin terminology from around the world. With the help of the Smithsonian Institute, he sent out questionnaires to American outposts across the globe. Analyzing the material that was returned, he discovered that there were six basic types of kinship terminological systems, which he called Eskimo, Omaha, Crow, Iroquois, Hawaiian, and Sudanese. Classificatory systems look nice on paper; however, on the ground, they are more complex, often exhibiting features of more than one of Morgan’s types. In this exercise, analyze one of the following kinship charts and classify it according to Morgan’s six classification schemes: Central Thai, Dogon, Hopi, Warao, or Kurds. Is there more than one system represented? What is the kinship terminological system of the genealogical chart you worked out in exercise #3? According to the anthropologist Victor Turner, symbols can have multiple, even contradictory meanings, especially ‘key’ symbols, which form the core of ritual expression and hold meaning for a whole society. Among the Ndembu, a group of people Turner studied, a key symbol is the Milk, or Mu Tree. The Mu Tree is a type of rubber tree, which exudes a milky white latex fluid. For the Ndembu the fluid symbolizes milk, the breast, womanhood, motherhood, the mother-daughter relationship, the matrilineage, matrilineality, and matrilocal residence. Some of these references contradict each other. For example, the mother-daughter relationship referred to in one instance is at odds with the recognition of the daughter’s womanhood, separate from her mother. Although men can identify with their matrilineage, they do not identify with the mother-daughter relationship, womanhood, and motherhood. Key symbols index both a common identity and the various social relationships that constitute the group. A key symbol marks difference at the same time that it transcends that difference. It represents both the one and many, penetrating and connecting the various layers of a culture to create meaning. Refer to the anthropologist Reichal-Dolmatoff’s text titled “The Loom of Life: A Kogi Principle of Integration” on the symbolism of the Kogi loom. To get familiar with the culture, each student should first read the culture summary of the Kogi, then chapter I (pages 5-10), and any one of the following five chapters. List all the things in Kogi life that the loom refers to. Discuss each chapter. Compare notes. Does your culture have an equivalent key symbol? One of the problems encountered by early ethnographers was recognizing and understanding communal forms of property. Many societies studied by anthropologists did not have the institution of private property. Instead property was held in common and its use was dictated by rules, customs, and status associated with kinship. Therefore, to understand property one had to understand kinship. This was a difficult concept to grasp for 19th century Western ethnographers for whom individual property rights were taken for granted and part of their own conception of their self as individual entities and of the world as constituted by discrete objects. To understand communal forms of property in all its cultural ramifications is a step towards understanding cultures in which private property is not a privileged institution. This requires a leap of imagination. For example, for the Tiv of Nigeria, the word TAR means many things, including the land on which they live, the lineage to which they belong, and the ancestors from whom they are descended. The use of one word to refer to these three different important cultural items suggests that they are inextricably linked in the Tiv imagination. We know that ancestors are a key focal point of lineages and that some lineages act like corporations holding property in common. We also know that one’s access to jointly held property is through membership in a kin group such as a lineage. To get familiar with the Tiv first read its culture summary. Read the following passage describing the Tiv relationship to the land. Be creative and make up a ritual that will embody the different meanings and relationships invoked by the word TAR, tying its different meanings together. Communal social arrangements were regarded as the antidote to social conflict and tension. However, while ownership may be held in common, problems still arise over its use. Land held in common is still cultivated by individual households. The arrangements for household use can be very complex and entail a great deal of maneuvering and negotiation, and require the mediation of a third party. The public recognition of a family’s genealogical connections becomes a particularly important step gaining access to a piece of land. Among the Amhara of Ethiopia descent is reckoned bilaterally which permits various avenues for finding available land and then making good on genealogical connections to claim that land. Examine both the genealogical chart (Figure 3) and land map (Map 4) from Allan Hoben’s monograph on Amhara cognatic descent groups. The brothers Dem and Gubeno hold the original grant to the Gra Midir section of the Wendim estate. Notice the pattern of land division. The section is divided into sixteen fields, eight for each of the descendents of Dem and Gubeno. Six of the Gubeno fields have been further divided into four fields for each of the descendents of Gubeno’s four offspring. Assume that all 17 descendents of Welde Natan want to farm in Gra Midir. How would you divide the land to give each household one plot of land? Households are not families. Households are the means by which a family provides for itself and reproduces. In terms of labor, many families are dependent on the services of others, living within or outside the household. The most extreme cases are royal households, which depend on a whole retinue of servants. In feudal Europe, whole villages grew up to service the needs of the aristocratic landowning families. However, the same is found in more modest households. Within the tributary state of the Austro-Hungarian Empire, the Austrian household, or ganzhaus, was dependent on the unpaid labor of junior kin. In his Peasant Classes: The Bureaucratization of Property and Family Relations under Early Hapsburg Absolutism, 1511-1636 (1983), the historian Hermann Rebel shows how under state exactions, the ganzhaus could not make a go of it without taking in the junior kin of other families as servants. In order for households to be viable in state societies, they must depend on poorly remunerated or uncompensated labor. Women in China’s patrilineal society are another case in point. They work hard to feed and raise a family but are not part of the patriline and have no claim to property. The Slovenian peasant household is an example of a household dependent on outside labor. This dependency is acknowledged in the annual pigsticking ritual (fure), in which outsiders are given a leading role and difference in status is glossed over by the reference to a shared peasant identity. One can treat the pigsticking ritual as a play with a social commentary. Read the description of the pigsticking ritual. Who are the players? What are their roles in the ritual? What are their roles in real life? Is there a difference in their relative status and power? What does it mean to be a peasant in this Slovenian community? What does it mean to be a family? The English philosopher Thomas Hobbes (1588-1679) argued that if everybody pursued their natural rights to the end, there would be anarchy, a state of continuous warfare of “Everyman against everyman.” According to Hobbes, in order to preserve peace and maintain order people conceded their natural rights to a higher authority, or sovereign, laying the basis for the state. Hobbes insight underscores the basic problem found in societies without sovereigns, in which groups are compelled to protect their rights and interests through the use of force. While this does not necessarily lead to a Hobbesian state of total chaos it does create a situation of controlled violence known as feuding. Feuding is not a state of barbarism as Hobbes would have it, but is often used by autonomous social groups of relatively equal power to address perceived wrongs. Feuding underscores a basic paradox that two different parties can be in the right. Feuding does threaten to undermine internal cohesion of the tribe and make it vulnerable to outside attack, which was the case for the Montenegrins living on the fringe of the Ottoman state. For that reason tribal leaders and the head of the Montenegrin church interceded to end the escalation of feuds. Read the following trial. Who is right and who is wrong? Can they both be right? What kind of authority does the bishop have in Montenegrin society? The study of leadership has taken a back seat in anthropology with its emphasis on structure and culturally mediated human action. Perhaps the explanation lies in the inherent bias of democratic societies against strong leaders and group behavior, and a mistrust of power and politics, in general. And yet good leadership and collective action can be an exercise of power to achieve goals beneficial to everyone in a group. Power by itself is neither good nor bad. It is the ability to act. Collective action is the most effective form of action and is based on good leadership and group cohesiveness. Marshall Sahlins’ study of New Guinea big men is a classic account of leadership. Unfortunately many textbooks treat big men as a stage in the evolutionary development of political organization and not a style of leadership that can be found in many small or large societies. Entrepreneurs, union organizers, community leaders are ‘big men.’ They serve a vital function in activating and tightening the bonds of social relationships that makes an organization a more effective unit and better able to realize its interests. Big men are found in times of historical change. For example, big men served an important historical role among the Ashanti as they lead followers to settle the forest region of south central Ghana. Big men also played a role in Taiwan’s frontier society, consolidating power and dampening internicine conflict. How big men go about their business varies with the type of society in which they live. The anthropologist Emrys Peters is particularly good in analyzing how Bedouin chiefs, or shaikhs, go about building power. Read part of the chapter, “The Power of Shaikhs,” beginning on page 120 and create a list of social, economic and political factors that contribute to a shaikh’s rise to power. If you had to chose one or two of the most important criteria which would it be, and why? Indigenous people understand that individual health is derived from the health of the group and community. A breach of social etiquette or moray, a conflict in social relationships can invoke the ire of supernatural beings and result in sickness for that individual. This interconnectedness of bodily health, social relationships, and the supernatural realm is an excellent example of the interconnectedness of culture. This approach to medicine is not far off from modern Western medical practices. Doctors take family histories of patients to determine genetically transmitted susceptibility to disease and the possibility of stress in family relationships, which can weaken the body’s resistance to disease. Doctors know that stress can negatively impact on the immune system and make an individual more susceptible to the countless pathogens that exist within and outside the body, resulting in sickness. Read the following discussion of shamanic medicine of the Yakut of Siberia, and construct a chart showing the relationships among demons, ailments, and remedies (beginning at page 170). What are some ailments you have had? How would you cure them if you were a Yakut? Create another chart for Garo sickness and cures (beginning on page 49). Psychology is the study of the human mind, the way it perceives the world and how it influences behavior. As Sigmund Freud observed, our behavior is as much influenced by how we imagine the world to be than the ‘real’ world itself. Franz Boas (1858-1942) discovered that accumulated knowledge, what he called ‘culture,’ comes between the environment and human action. Culture is a product of the collective imagination. Although it is difficult to get inside the mind of any one person much less a person from another culture, ethnographers who have had a long association with a culture, or study their own culture have the unique opportunity to probe this psychic realm. Read Rupert Ross’s personal account of Ojibwa thought processes based on his own experience as a fishing guide on Lake Temagami in northwestern Ontario. For the Ojibwa, knowledge is accumulative experience and thinking is more than a rational thought process; It also includes one’s feelings and intuitions. Ojibwa hunters rely on their hunches as much as anything else. This idea of embodied knowledge is found in the Chipewyan notion of supernatural power, or inkonze, which translates as ‘to know a little something.’ Inkonze expresses an underlying unity in all things, which connects humans to the environment and mind to body. Read David Merrill Smith’s vivid first-hand account of inkonze. After reading both Ross’s and Smith’s accounts, ask yourself how valid is the ethnographer’s use of his or her own personal feelings and experience to explain that of other peoples and cultures? What is the underlying assumption one must make to accept such an analytical approach? What forms of embodied knowledge do you have in your own culture? Ethnogenesis is a way of looking at culture as a historical and complex process of cultural and group formation. In spite of their own mythmaking, ethnic groups are not immutable and pure, with roots in a timeless past. Rather they represent the convergence of people of disparate backgrounds, who forge a common purpose and identity in order to survive. Italian Americans, the Lakeshore Tonga, Early Han settlers of Taiwan, and Quinault Indians are examples of ethnic groups formed by different groups of people each with a distinct local, regional, or tribal affiliation and identity. Circumstances force people to broaden their affiliations and form a pan-ethnic identity. Meyerowitz’s oral history of the Akan provides a good account of the movements of the different peoples who make up the Akan-speaking people of present day Ghana. Read about the Etsi people. What are the reasons for their migrations? Who did they come into contact with? With whom did they fight; With whom did they join up, and why? 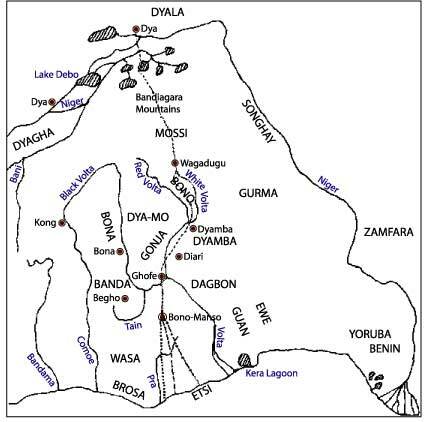 On a map (see image) of the Niger and Volta region, plot the movement of the Etsi and include the names and homes of the various peoples with whom they came into contact. The longstanding human interest in astronomy and the wealth of astronomical knowledge produced by early cultures indicates that people have long been careful observers of the world around them. Astronomical observations formed the foundation of cosmology and mythology and were a source of their validation. The periodic movement of the sun, moon, stars, and planets were a sign of constancy, certainty, and predictability in a world otherwise beset by the vicissitudes of life and the ultimate question of death. Astronomy provided an anchor to thought systems. As societies became more socially complex, the need for a stabilizing ideology became more acute and cosmology took a more prominent role in the creation of a self-referencing and authenticating worldview. In this exercise read John Sosa’s description of the Mayan cosmos (pages 132-137.) Referring to Sosa’s cosmological map, identify the terms used and add other corresponding elements discussed in the section, such as gods and the site plan of the village. Is cosmology a science? Argue both for and against this question. Witchcraft is prevalent in small-scale egalitarian societies and marks a profound ambivalence concerning authority and power. Although strong leaders among the Saramacans of South America were recognized as cultural heroes for mobilizing the population to defend themselves against outsiders, at the same time they were feared and regarded with suspicion. One cultural hero saved the Saramacans against the Dutch, however he was a ruthless murder and adulterer, preying on his own people. The Tiv of West Africa consider all elders as witches, revealing their ambivalence about the power elders hold over the rest of society. Elders control both property and ritual through their membership in secret cults. At Tiv funerals autopsies are performed in which the deceased’s heart is cut out to determine whether or not that person had been a witch (mbatsav.) The judgment has consequences for the reconstitution of social and property relations that occurs after each funeral. Funerals are an opportunity for relatives to air their grievances and have them addressed in some equitable fashion. Fear of witchcraft reflects a general ambivalence regarding human intentions. Are a person’s actions self-serving or group serving? How can one tell? Can they be both? Read the Bohannans’ account of a Tiv funeral and post-mortem from their field notes, beginning on page 778. (Section 2. MbaKuhwa’s Funeral.) Is the deceased a witch? What is the decision based on? What are the consequences of the decision? *The illustrations on this page are to be used only in conjunction with eHRAF World Cultures and eHRAF Archaeology and cannot be reproduced for profit.